Why Choose Acumatica for eCommerce? With an Acumatica eCommerce software solution, you can manage eCommerce orders, inventory, picking-packing-shipping, returns, customer support, and accounting from one dashboard. 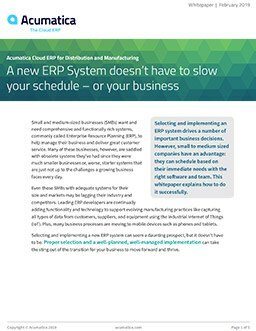 This complete eCommerce ERP solution tightly integrates Acumatica’s Financials, Sales, Inventory, CRM, and Fulfillment systems with popular eCommerce platforms. That means you can promise your customers more—and then deliver. Connect with Acumatica Inventory Management to optimize your stock levels through automated replenishment. Get real-time inventory counts across your business with a website that is integrated with your ERP system. Reduce shipping and packing errors by automatically printing barcode labels and pick tickets. Scan picked goods when they are placed in a box and confirm shipment. Integrate with UPS WorldShip and FedEx Ship stations for even greater efficiency. Boost customer satisfaction by automating shipping and receiving workflows. Manage returns for credit with automated reporting and quality control. Centralize processing by integrating your eCommerce website with backend software from Acumatica. Utilize single stream fulfillment for online sales, counter sales, catalogue sales, and telemarketing sales to serve a wide range of customers. Read more about the Acumatica retail solution. Integrate Acumatica to popular eCommerce platforms, such as Magento and Shopify, or connect Acumatica to marketplaces using our integration technology. Centralize your processing for all channels. Use single-stream fulfillment for online, counter, catalog, and telemarketing sales. Read more about B2B eCommerce software. Establish control over your products and give customers the options they’re seeking. Use the multi-level, dimensional, rules-based system with non-hierarchical feature selections and configuration evaluation. Use on quotes, sales orders, and production orders with real-time price and cost rollup. Manage leads, contacts, opportunities, and accounts and see all customer interactions from initial quote to service after the sale. Know your sales tax obligations by state and region and automatically integrate sales tax to online orders. Expand your market reach through integration with popular marketplaces, including Amazon, EBay, and Etsy.